The wrong man scenario is one that Alfred Hitchcock not only seemed to be obsessed with, but one that he made his own. When choosing the best of his “wrong man”, there’s no doubt that his 1935 adaptation of John Buchan’s The 39 Steps would at least reside near that top. The apparent master of suspense is firing here on all cylinders, creating ideas and motifs that would continually crop up in his later and often more regarded features. The 39 Steps concerns the unlucky fate of emigrating Canadian Richard Hannay. By accidentally picking up the beautiful spy Miss Annabella Smith while on a night out at the local music hall, he becomes entangled in a web of intrigue and industrial espionage as it turns out the spy was being hunted for her connections with the 39 steps; a criminal group of spies out to leak British air design secrets abroad. Within seconds of the film opening, it’s clear that Hitchcock has an eye for innovative and timeless visual ideas. Even the simplest of acts such as creating the setting of the music hall is built from beautifully composed shots at German Expressionist angles with moody lighting. This is verging on Film Noir years before the genre has even set foot in popular cinema and must have been a shock at the time to see such a dramatic step away from the norm. With the spy killed in his apartment, Hannay must go on the run from both the spies now after him and the police who believe him to have murdered Miss Smith. 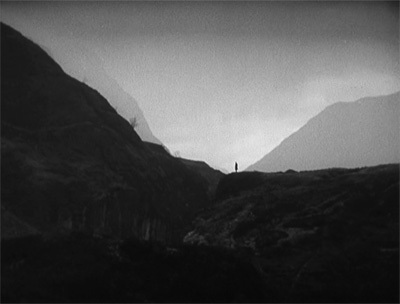 The epic cat and mouse chase starting from a train journey through to the misty hills of one of the more generalising depictions of Scotland, justifies Hitchcock’s oft quoted title of master of suspense. Yet there is much more to these sections than just a mere exercise in entertainment. Though associated with the suspenseful and perhaps even sometimes the macabre, a strong and successful strand of dark humour is upheld throughout the film as well as in these particular sections. This is represented perfectly by Hannay’s two fellow passengers on the train who are woman’s underwear salesman. In an instant, the tension is broken and we’re witness to some cunningly witty humour. The first half of the film however boasts more of Hitchcock’s traditional dark strands than this sly wit and this is typified best in Hannay’s first choice of haven; an isolated Scottish farm inhabited by a religious farmer and his oppressed little wife. The atmosphere here is on tenterhooks from the start with Hannay mistaking the farmer’s wife for being his daughter. From there on, we’re witness to the most awkward meal imaginable. This strand is closed when, upon learning that his wife gave Hannay his coat containing his prayer book, he beats her. Played marvellously by John Laurie of Dad’s Army fame, he showcases a masterful and underplayed dominator who is often looked over in reviews of the film. Yet his character is proof that even the smallest of details in a Hitchcock film are well thought out and intelligent. The second half of the film contains more of the previously mentioned humour but also cranks up the tension with various arrests and re-arrests as it becomes clear that it’s extremely difficult to know who to trust. This mix of humour and tension is perhaps one of Hitchcock’s defining traits and the scenes that handcuff Hannay to his initial snitch Pamela, are hilariously dark. Playing on the worry that he actually is the killer, Hannay forces Pamela to stay the night with him in an inn pretending they’re a run away couple. This is where Robert Donat shines best as the true British chap who not only is utterly charming even when threatening her but also convinces her that he’s pointing a gun at her back when it is in fact his pipe. The 39 Steps is also one of the first Hitchcock’s to fully push and experiment with the visual elements too. One particular cut springs to mind where a studio bound, moving car with back screen is shown but then is cut to an actual car driving along a road with ingenious slight of hand. By moving the camera to the black of the studio car before to the real car we get a smooth cut using the blackout of the cmaera. It’s something Hitchcock would continue to use even up to his last film in Frenzy but it is never better realised than here. Even the simplest of visual elements have been tweaked and refined to give new and startling effects. Some of the silhouette shots of the chases on the Scottish highlands wouldn’t seem too out of place in a Lotte Reiniger short proving that art-house mentalities can fit into a popular mould. Overall The 39 Steps is an important film for Hitchcock. It brings together most of his major themes successfully and shows a desire for experimentation but not at the cost of the narrative or entertainment value of the film. This sums him up perfectly and The 39 Steps is Hitchcock in its most pure and undiluted form.